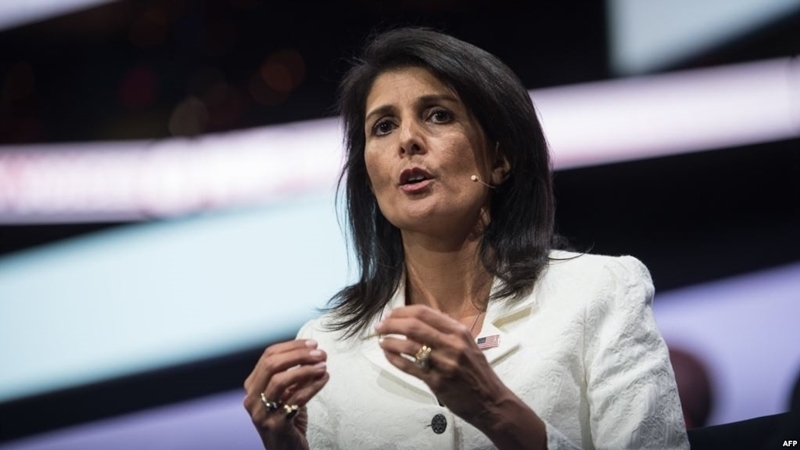 US Permanent Representative to the UN Nikki Haley said that the US was inactive in 2014 during the annexation of Crimea by the Russian Federation. According to Haley, when the US does not defend its allies and its values, it suffers together with the world. She made a corresponding statement during her speech at the University of Duke in North Carolina. "The United States also stood and watched in 2014 while Russia attempted to focibely redraw Europe's borders for the first time since World War II. Russia invaded Ukraine - swallowed the Crimea, and continues to push its way into eastern Ukraine," she noted. Haley stressed that her predecessor of the times of George W. Bush accused the UN of being politicized and ineffective. Nikki Haley stated that the US will never be friends with Russia. She went on saying that the US will work with the Russian Federation only when they need it. Earlier, US Deputy Finance Minister Sigal Mandelker stated that the US Treasury Department intends to continue pressure on Russia, including introducing additional personal sanctions for the annexation of the Crimea and possible interference by the Russian Federation in the election of the US president. According to her, Washington is focused on exerting pressure on the Russian Federation due to the constant destabilization of the situation in Ukraine, in particular, the occupation of the Crimea and the systematic violation of human rights.